“Season 2 will not require anything from Season 1 and you will not have to have played Season 1,” Matt Leacock said on the Ludology podcast. “It’s a fully standalone product.” When asked if there are going to be additional seasons, Leacock said he doesn’t know if any more are planned. 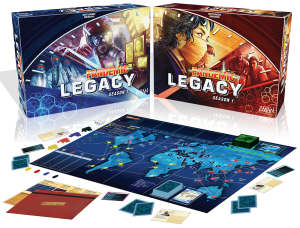 Pandemic: Legacy Season 1 is published by Z-Man. In it, the base Pandemic game will change over the course of twelve to twenty-four games. As the game is played, permanent changes to the game are made, such as stickers being added to the rules or the board, cards being destroyed, and writing on the game’s board. Leacock describes legacy games as games where the “consequences of your actions in any one game will have reprecussions down the line the next time you play it…. You can evolve a story over time, like you might if you are watching say, a tv episode or a tv series like HBO’s Game of Thrones or something, where the story builds week after week.” In the six months since Pandemic: Legacy was released, it reached the number one ranked game spot on BoardGameGeek.com.